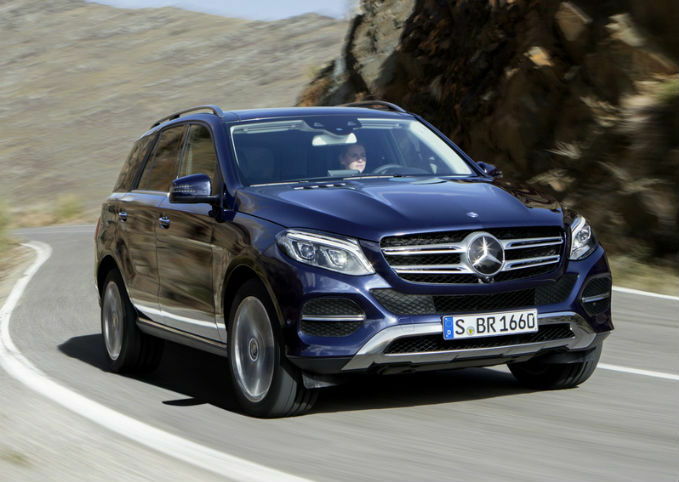 See used Mercedes-Benz GLE-Class listings in your area. Introduced in 2016, the Mercedes-Benz GLE-Class stays true to the M-Class that it replaced by offering consumers a spacious interior, numerous powertrain options, refined styling, and for those that aren’t willing to completely trade in their sports car for a SUV, a four-door coupe variant. With a healthy slathering of high-tech features, there’s a lot to like with one of Mercedes' most popular vehicles. There aren’t a lot of changes for the 2018 model year. Both the GLE43 AMG and the GLE43 AMG Coupe get a bump in power, as the twin-turbocharged, 3.0-liter V6 engine now produces 385 horsepower, an increase of 23 horses from last year’s model. The GLE43 AMG Coupe also receives an AMG Performance Studio Package. The GLE-Class is available with four different powertrains ranging from a 302-hp 3.5-liter V6 all the way up to a monstrous 577-hp 5.5-liter twin-turbo V8. A plug-in hybrid variant is available that utilizes a twin-turbo 3.0-liter V6 and an electric motor for a total of 436 hp. The GLE-Class Coupe is the more performance-oriented variant, as it is only available in AMG trim, with output ranging from 385-hp with the GLE43 Coupe to 577-hp with the GLE63 S Coupe. As a midsize SUV, the GLE-Class is rated to hold up to 80.3 cubic feet, while the coupe, with its more athletic looks, isn’t far behind with a cargo capacity of 60.7 cu ft. Most GLE-Class models offer the following as optional extras: massaging front seats ($1,100), heated rear seats ($580), a Bang and Olufsen audio system ($5,800), three-zone climate control ($760), and a panoramic sunroof ($1,000). These options broadly carryover to other GLE-Class models. The GLE350 is the only model that’s offered with rear-wheel drive and is priced at $53,195, including the $995 destination fee. A GLE350 4Matic is available, but is a little more expensive at $55,695. Both of the trims are powered by a 3.5-liter V6 that generates 302 hp and 273 pound-feet of torque. The SUV features a seven-speed automatic transmission and will return 18 miles per gallon in the city and 23 mpg on the highway. Standard features include 19-inch five-spoke wheels, aluminum roof rails, a leather steering wheel, side-mirror puddle lights that feature the Mercedes-Benz logo, Eucalyptus wood trim, rain-sensing windshield wipers, push-button start, a rearview camera, Active Brake Assist, Crosswind Assist, an auto-dimming rearview mirror, power liftgate, power driver’s seat with memory, dual-zone automatic climate control, power tilt and sliding sunroof, an eight-inch high-resolution color screen, and more. Available packages on the GLE350, and the rest of the GLE-Class include the Parking Assist Package ($1,290) that adds a surround-view camera and an automatic parking assist, which is a system that helps drivers get into and out of difficult parking spots. The Premium 1 Package ($3,050) brings Android Auto and Apple CarPlay compatibility, push-button start, navigation map updates for three years, SiriusXM Radio, Lane Keeping Assist, Blind Spot Assist, a Harman/Kardon surround audio system, a 115-volt power outlet, Mercedes' COMAND infotainment and navigation system, and a touchpad controller. Adding the Night Package ($3,200) brings an AMG body kit, gloss black exterior accents and 20-inch black AMG wheels to the SUV. The AMG Line Exterior Package costs $2,900 and includes its own set of 20-inch wheels and the same AMG styling. The AMG Line Interior package ($350) incorporates brushed aluminum pedals, sport front seats, and sport interior appointments. The Premium 2 Package ($5,340) adds everything from the Premium 1 Package in addition to rear center-armrest pass-through, active LED headlights, rear window sunshades, heated and cooled front cupholders, illuminated front door sills, automatic high beams, and multicolor ambient lighting. The Premium 3 Package ($8,230) combines the first two Premium Packages and adds lane-keeping assist, automatic emergency braking, full-speed adaptive cruise control, and the Pre-Safe Plus rear-end collision protection system. 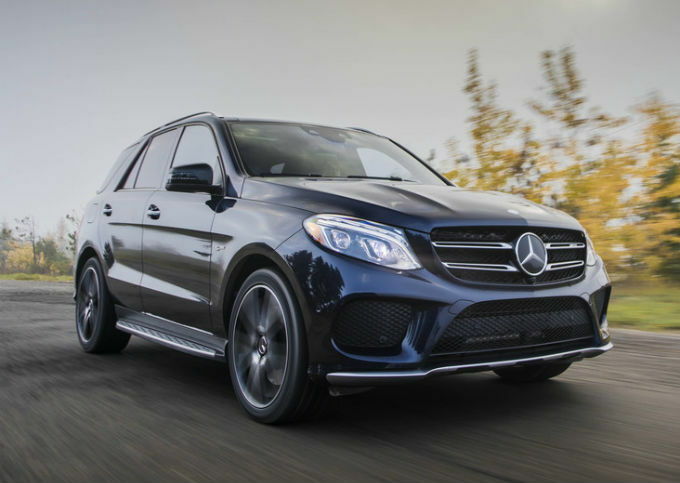 Starting at $67,695, the GLE550e 4Matic is powered by a 3.0-liter twin-turbo V6 engine and a hybrid powertrain that produces a total of 436 hp and 479 lb-ft of torque. The engine is paired to a seven-speed automatic transmission that helps put the power down to all four wheels through an all-wheel-drive system. Standard features on the 550e 4MATIC trim include: a four-mode drive selector, dual chrome exhaust tips, heated front seats, leather seats, COMAND with a touchpad controller, COMAND navigation, Apple CarPlay and Android Auto compatibility, in-dash DVD/CD player, and a Harman/Kardon sound system. 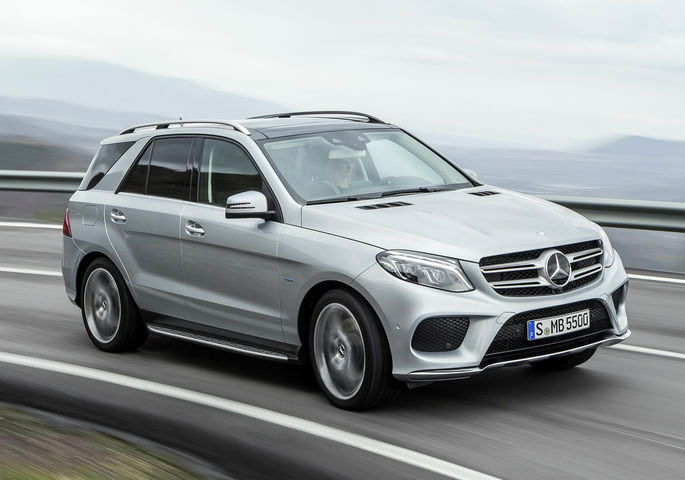 Fuel economy estimates for the GLE550e 4Matic are not available yet. Both the GLE43 AMG and the GLE43 AMG Coupe feature an AMG-enhanced, twin-turbocharged 3.0-liter V6 engine that’s good for 385 hp and 384 lb-ft of torque. The engine is paired to a nine-speed automatic transmission and puts its power down through a standard AMG-tweaked 4Matic all-wheel-drive system. The GLE43 AMG costs $68,745, while the Coupe is priced at $71,495. The vehicles share a lot of the same features, which includes AMG Dynamic Select system, which allows drivers to choose between four driving modes to optimize their car's performance, adaptive dampers, aluminum paddle shifters, an AMG exhaust system, a sport steering wheel, AMG body styling, 20-inch AMG wheels, brushed aluminum pedals, and leatherette upholstery. 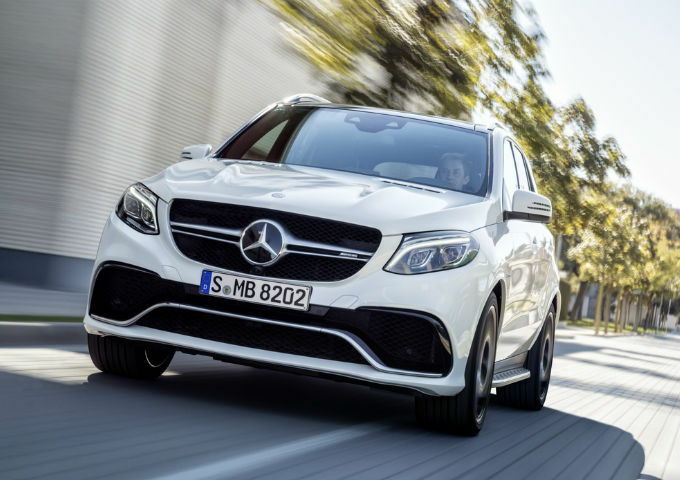 The GLE63 AMG is only available in a traditional SUV body style and is powered by a twin-turbocharged 5.5-liter V8 that generates 550 hp and 516 lb-ft of torque. The engine is matched to a seven-speed automatic transmission that helps the SUV get to 60 miles per hour in just 4.2 seconds. 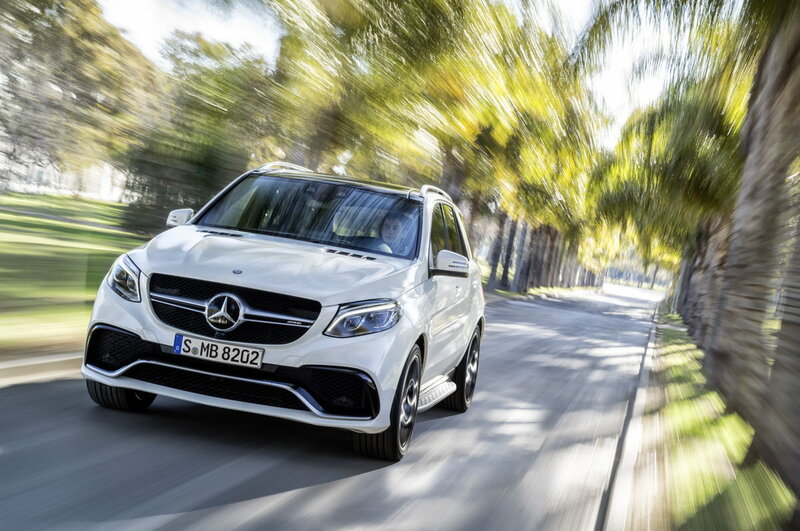 Standard features for the GLE63 AMG include an AMG-tuned suspension, an Active Curve System that stiffens the vehicles’ chassis during cornering for flatter handling, and an AMG performance steering wheel. 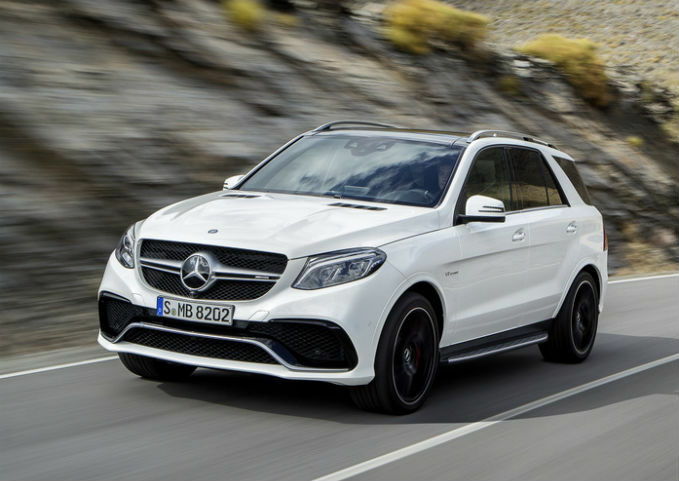 The GLE63 AMG is priced at $103,545. Starting at $110,695 for the GLE63 AMG S and $112,855 for the GLE63 AMG S Coupe, both models feature a twin-turbocharged 5.5-liter V8 that produces 577 hp and 561 lb-ft of torque. Thanks to a seven-speed gearbox, both the standard body and coupe are capable of getting from zero to 60 mph in just 4.1 seconds. As the range-topping models, both the GLE63 AMG S and GLE63 AMG S Coupe are packed with loads of standard features, including a standard Start/Stop system (which seems a bit funny attached to a 577-hp V8), an AMG-tuned 4Matic all-wheel drive system, high-performance AMG brakes, topstitched dashboard trim, dual chrome AMG exhaust tips, red-painted brake calipers, AMG illuminated front door sills, 14-way power AMG sport front seats, and heated and ventilated front seats.